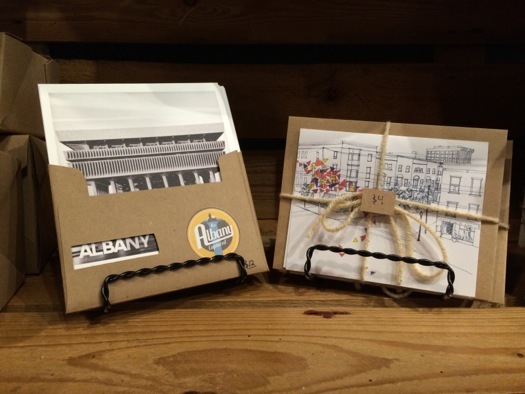 Biernacki told us this week via email that he'd been thinking about making Albany souvenir items after doing some freelance design work for the Downtown Albany BID. When he heard that Cider Belly might be interested, he got in touch with the owners and the souvenir stand idea came together. The stand includes some item with beautiful designs. But the thing that really made us smile was that ESP mini bowling set. 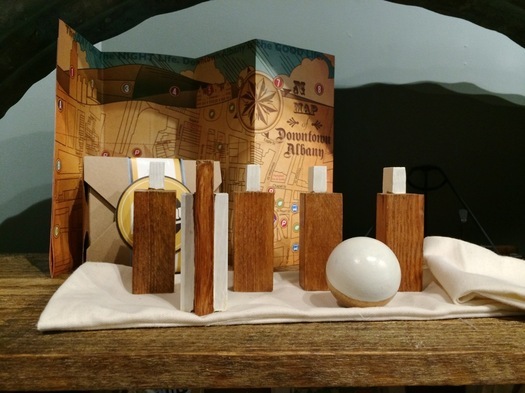 "My goal is to make new and interesting souvenirs," Biernacki wrote to us. "I didn't want a stand full of shot glasses and key chains so I researched vintage gift shops and really looked at the city for some original ideas. I had seen a mini desk bowling set and it just clicked in my head." Biernacki said he draws inspiration from Albany's architecture. And he pointed to the book Albany Architecture: A Guide to the City as a go-to resource. The love of local architecture also led him to get in touch with artist Cara Mary, who created greeting cards and a map for the stand. 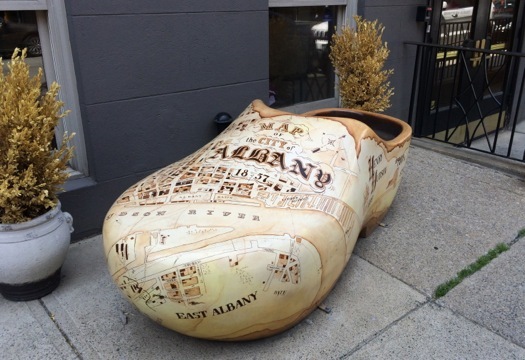 Oh, and if Mitchell Biernacki's work looks a bit familiar, you might have already seen some of it before -- he designed one of the giant Dutch-style clogs that first went on display as part of Sculpture in the Streets in 2012. That shoe is now outside the BID office on Lodge Street. Biernacki told us he's hoping to make smaller versions of the shoe that can be sold at the souvenir stand. 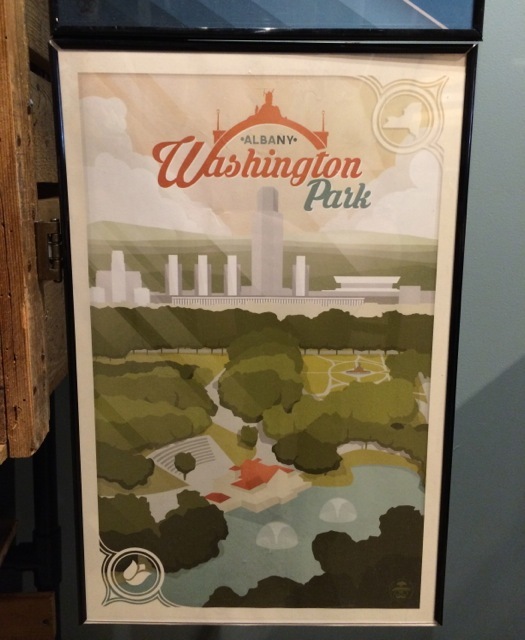 See also: Biernacki's DaydreamHunter Etsy shop, which includes some beautiful posters inspired by the Adirondacks. I noticed that today when I went in for a coconut orange doughnut (mmmmm, bliss). It looks great. Mitchell's Dutch show was my favorite of the set and I'm glad it's still downtown. I see tourists walking around the city ALL of the time. 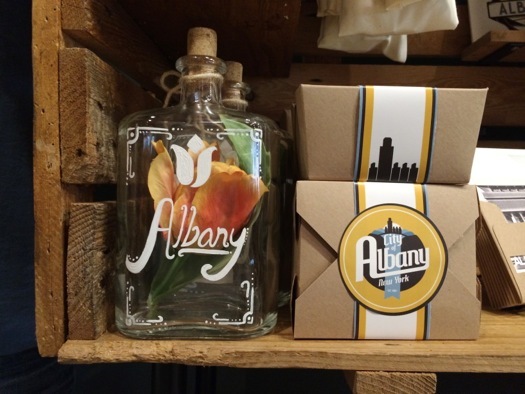 It used to surprise me to see tourists, but now I think, "Albany is awesome -- of course we have tourists!" Wish we still had the "Aquaducks" tours, though. 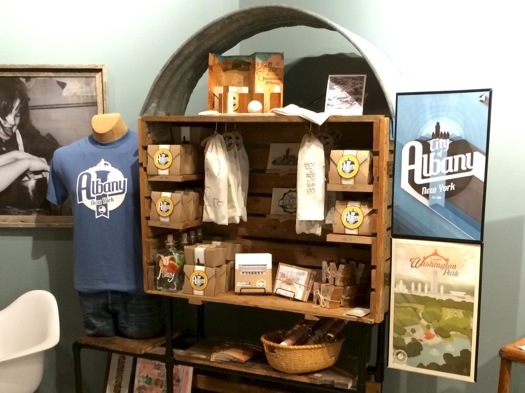 This is a great idea, and the ESP bowling kit is fantastic I'd love to see some more wearable souvenirs, too, such as funny Albany-themed t-shirts (like the ones you'd see at Troy Cloth & Paper or something akin to the "Albany is egg-celent" shirt). Ideally, people will wear these things when they go back to their home cities, causing others to ask about the shirts and (hopefully) about Albany. My father owned a print shop, card,gift shop, and souvenir business from 1928 until 1969. The name of dad's business was Princly's. His photographer used to work for Rocky. Sheldon Tumor was his name. Dad supplied Coulson's, hotels, mom & pop stores the airport, bus & train station. He printed everything from birth announcements to death acknowledgements. One year he even printed Christmas cards for the N.Y.S. Assemby & The F.B.I.! I still have some Old Albany post cards . Sold most of them to Morris Gerber, a good friend of dad's. 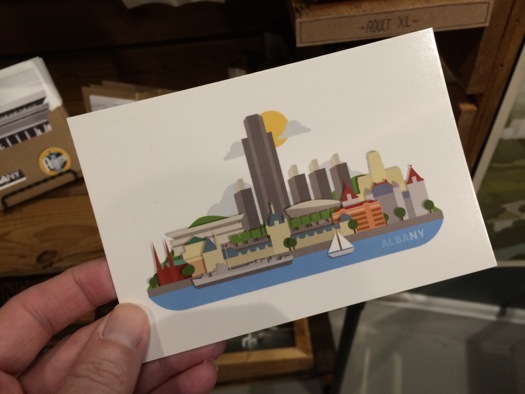 I went on a tour of the capital building, and the visitor center in Empire State Plaza where the tour starts also has some cool local souvenirs.